Whether covered by a dental plan through an employer or an individually purchased policy, many people are under the impression that their dental insurance will cover 100% of their dental expenses. While dental coverage can help take the “bite” out of the high cost of dentistry, the reality is, no dental plan covers all charges without some out-of- pocket expense to you. Here’s why you’ll need to be prepared for some financial responsibility — even with a dental insurance plan. Dental Insurance plans usually set a limit on how much will be paid out in benefits for each covered person during a calendar year. This means that once you reach the maximum payout, which on average is around $1000, you will be responsible for the full charge for any additional dental treatment you might need during that year. Most insurance plans require that you meet a yearly deductible. This is the amount of money you owe to the dentist before the plan begins to pay any benefits for dental treatment. Deductibles, which typically range between $50 to $100, are often waived for preventive services, like cleanings and checkups, but come into play with basic and major services. Traditional dental plans allow you to go to any dentist of your choice, and the benefit payment is based on a percentage of the dentist’s fee. You’re responsible to pay the dentist the difference between the amount the plan paid and his fee; this is called a copayment or coinsurance. Co-payment amounts are usually lower, when you belong to a Preferred Provider Organization because if the treatment is done by a participating dentist, the benefit payment is based on a reduced fee, which the provider has agreed to accept. Some plans have waiting periods, which are specified periods of time that have to be met before benefits will be paid for certain types of dental treatment. These waiting periods are most often put in place for major services such as tooth replacements. Dental plans are designed to provide benefits only for treatment that is medically necessary. So for example, if you are interested in having a cosmetic service, such as tooth whitening, you’ll be responsible for the full cost of the procedure. 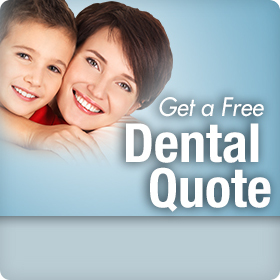 Because dental discount plans are not dental insurance, there are no deductibles, plan maximums, or waiting periods. When you go to a dentist who participates in the discount program, you can expect to receive reduced fees, anywhere between 5% to 50%, on all dental treatment, including cosmetic and orthodontic services. This type of affordable program can greatly reduce your out-of-pocket expenses, whether you have a traditional dental plan or no insurance at all. While no dental plan offers 100% coverage, you can take the sting out of dental expenses with a dental discount plan. Just click on the link to the right to access Confident® dental discount plans offered through Careington® and a list of participating dentists in your area.